An expendable launch system is a launch system that uses an expendable launch vehicle (ELV) to carry a payload into space. 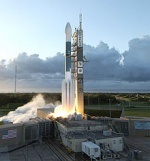 The vehicles used in expendable launch systems are designed to be used only once (i.e. they are "expended" during a single flight), and their components are not recovered for re-use after launch. The vehicle typically consists of several rocket stages, discarded one by one as the vehicle gains altitude and speed.